Jacqueline Lonsdale-Cuerton was a 'war baby'. Born in the UK in 1941, she travelled with her family to Brisbane, Australia in 1950. It was a time of great migration to 'better places', 'safer countries' after the maelstrom of Britain and Europe of the 1940s. Yet it was for a family member's health the journey was made, searching for a better climate to alleviate the problem. Jacqueline often muses in a wistful way, of her longing for that place of her birth she was drawn away from all those years ago, and her restlesness, never settling in any one place for too long. However, from that restlessness has evolved a keen, observational eye, an acute sense of even the simplest situation, bringing the ordinary to life through her ability to express that simplicity in an extraordinary way. 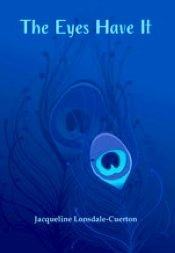 The Eyes Have it, a collection of poems by Jacqueline Lonsdale-Cuerton. 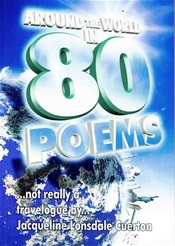 Around The World in 80 Poems, by Jacqueline Lonsdale-Cuerton. 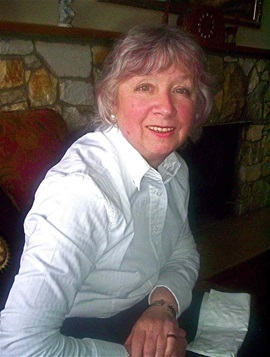 Published in 2008, Around the World in 80 Poems, not really a travelogue, by Jacqueline Lonsdale-Cuerton, covers a twelve-month period in her life, when she ultimately made it back to the land of her birth. Often describing her life as 'peripatetic', for those who know her this is an apt description. Having been brought from the UK to the land of sun, sand and surf, Brisbane, Australia, aged 9, with perhaps some misgivings, even at that tender age, the innate urge to return to the land of her heart never released her from its grip - until the opportunity to return came almost five decades later. This time of travel allowed an exploration of the globe along the way. In her inimitable way, the poet has created a substantial collection of poetic observations, shared her opinions and unique descriptions of the sights, sounds - and the people she met along the way. 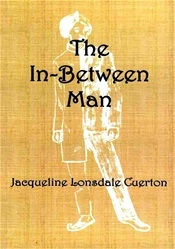 The In-Between Man by Jacqueline Lonsdale Cuerton. In this her first novel, The In-Between Man, (2007), Jacqueline Lonsdale-Cuerton explores the delicate balances that hang between the old customs and the new, the differences between the Asiatic and the Western lifestyles that create a schism for the emerging younger generation born into an Anglo-Indian relationship. The assimilation from one cultural life to another during a generational change. The expectations of the old guard for the new.